How much money has Kyiv received from the IMF since 2014? Less than you’d think. 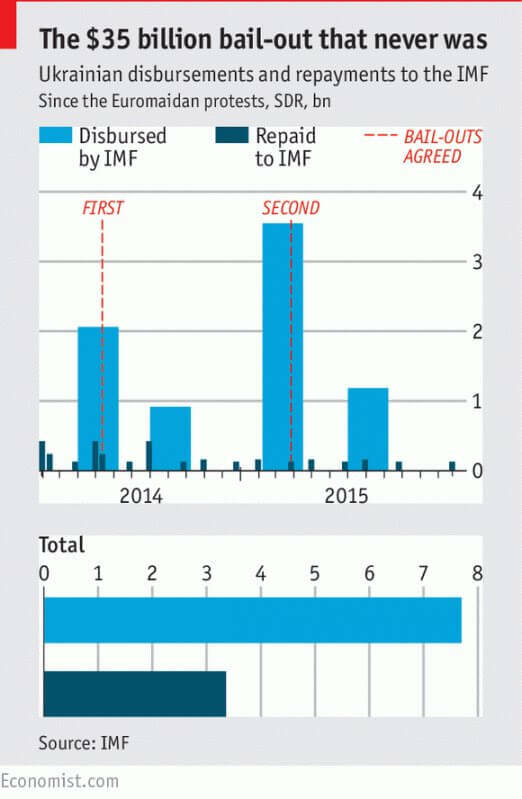 In April 2014 Ukraine agreed a $17 billion bail-out with the IMF. Then in March 2015 Ukraine agreed a new, $17.5 billion dollar bail-out. You would be forgiven for thinking that in the last two years the IMF had disbursed $35-odd billion to Ukraine. In reality, as it does to other countries, the IMF drip-feeds money; it does this in order to ensure that the conditionalities it sets down in the bail-out agreements are being followed. Ukraine, particularly the finance ministry, is meeting some of these targets. It is embarking on a severe austerity programme (for which the hapless Mr Yatsenyuk is taking much of the criticism). Pensions have fallen by about 40% in real terms in the last two years and the number of teachers has been cut by about 15%. Austerity is highly likely to have cut into growth and reduced living standards.